PennyMAC Reviews - Is it a Scam or Legit? PennyMAC home loans are available in 49 states, and come with a fast preapproval process, low down payments, closing in as little as 30 days, and more. Founded in 2008 by a team of mortgage industry veterans, PennyMAC offers “innovative mortgage solutions” that can help you buy a home, refinance at a lower rate, or obtain loan assistance. Depending on your circumstances, PennyMAC can provide fast preapproval, low down payment options, competitive interest rates, and closing in as little as 30 days. Regardless of your circumstances though, you’ll always receive exceptional service and a hassle-free experience, due to the company’s focus on accountability, reliability, and ethics. And compared to other mortgage providers, PennyMAC doesn’t just provide your loan, but they also service it. So everything stays in-house. Sure, these are some great benefits. But does this necessarily mean that PennyMAC is your best option for a home loan? That’s what we’ll help you figure out here. Let’s start by looking at the types of loans PennyMAC provides. As the name implies, PennyMAC’s adjustable rate mortgages (ARM) carry a fixed interest rate for 3, 5, 7, or 10 years, after which it will change based on a market index. ARMs can be ideal for those who plan to sell their home before the adjustable rate kicks in, or for those who are sure they can afford the new rate if it increases. In contrast to ARMs, fixed rate mortgages maintain the same interest rate for the life of the loan (anywhere from 10 to 30 years). Fixed rate loans are best for those looking to set a budget and stick to it. But keep in mind that the shorter your term, the faster you’ll build equity. Compared to other options, PennyMAC’s FHA loans can come with several distinct advantages, including down payments as low as 3.5%, along with flexible income, debt, and credit requirements. These loans are also insured by the Federal Housing Administration, which means there’s no PMI requirement. However, depending on the county in which you live, maximum loan amounts may apply. If you’re a veteran (or the spouse of one), VA loans can help you get into a home with no money down (as long as the loan amount doesn’t exceed county limits or available entitlement), no monthly mortgage insurance, limited closing costs, and flexible credit and liability guidelines. VA loans are also assumable by other veterans and come without prepayment penalties. If you’re planning to purchase a high-value home, PennyMAC’s jumbo options can provide up to $2 million in financing, whether this is your first or second home, and whether you’re looking for fixed rate or adjustable rate. With so many options, what’s the best way to choose your next mortgage? Perhaps the biggest choice you have when it comes to taking out a mortgage is whether you want a fixed rate or adjustable rate. In many cases, ARMs come with lower interest rates than fixed rate loans, although as soon as the adjustable rate kicks in, your monthly payments could increase greatly. The other thing you’ll want to consider is how large of a down payment you’d like to apply. Although you’ll find that lenders can generally accommodate anywhere between 3.5% and 20%, if you put down less than 20% you’ll also have to pay private mortgage insurance (PMI). This can add another 0.5% to 1% to your overall annual cost. How Long Should Your Loan Be? Then, you’ll need to decide on the length of your loan, which can range between 10 and 30 years. Although longer terms come with lower monthly payments, it might be worthwhile to consider a shorter term if a major life event is approaching (e.g. kids going off to college, retirement, etc.). Keep in mind that, while this information can help put you on the right track, it’s by no means exhaustive. If you have additional questions, we’d recommend speaking with a mortgage professional. While this isn’t the case with PennyMAC, does this necessarily make them a better lender? What are their customers saying? After Countrywide Lending went belly-up during the 2008 financial crisis, PennyMAC was founded by former President Stanford Kurland. But do they offer better service? At the time of our research, there were 206 PennyMAC complaints on PissedConsumer. The overwhelming majority of these appeared to reference poor customer service, especially checks taking months to receive, and difficulty making mortgage payments on their website. On Yelp, PennyMAC had an average rating of 2 stars, based on 58 customer reviews. Again, many customers claimed that it took weeks to receive checks from the company, along with payment issues on their website and ineffective customer service. In fact, more than one customer claimed PennyMAC was the worst company they’d ever dealt with. Despite these common claims, PennyMAC had an A+ rating with the Better Business Bureau based on 267 closed complaints (as of 12/8/15). There, complaints seemed to reference inconsistent information from the company (up to and including the day of closing), problems getting payments applied/receiving escrow checks, and runaround from customer service. As with any other lender, the interest rates you’re charged by PennyMAC, along with points and other fees, is dependent on a variety of factors. These include your creditworthiness, current mortgage rates, the type of loan you’re taking out, and much more. However, you can check out PennyMAC’s simple mortgage calculator, which will also display current rates. Alternately, you can contact a PennyMAC loan specialist at (866) 549-3583. Taking all of this together, should you go with PennyMAC for your next mortgage or refinance? 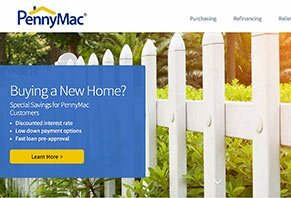 Is PennyMAC a “Different Kind of Mortgage Provider”? We’ve reviewed many popular mortgage lenders here at HighYa, including NewDay USA, LendingHome, and Quicken Loans, not to mention comparison sites like Guide To Lenders and Fetcharate. But is there anything that makes some of these lenders better than others? While lenders don’t have a lot of control over the interest rates you’ll receive, they certainly can control the service experience that their customers have. To this extent, PennyMAC seems to place a great deal of emphasis on providing excellent service. And although there seem to be an excessive number of customers complaining about PennyMAC’s service, considering the number of clients they have, this might be considered relatively low. Whatever option you end up choosing, just be sure to do all your research first (you’re already off to a great start)! Everyone at PennyMAC is so very nice and helpful. The company has the best customer service skills and makes you feel like family. Other companies are a nightmare, but PennyMAC truly cares and helps you with a great heart. PennyMAC is the best company that truly cares and are very best at truly helping people. Our mortgage got transferred to Fay Servicing and we miss PennyMAC. They truly care and want to help. No surprises, just truly nice, knowledgeable, and helpful. PennyMAC is in charge of sending payment to my homeowner's insurance every year. In 2016, they decided to pretend to contact my homeowner's insurance for payment for the upcoming year. Since PennyMAC claims they were "unable to make contact" they forced an insurance that was 7 times higher than I normally pay. You would think PennyMAC would attempt to contact me to let me know they are having issues with making payments, but they never did. I called to see what methods they used to contact me, and they said they sent me three letters. The three letters they sent were addressed to a home I had not lived at for two years, even though they had my correct home address on file. I asked, "why is it that you mail everything else that's not important to the correct address, but mail the important documents to the wrong address?" Their answer was that there must have been a "glitch" in the system. They have stolen my hard earned money to keep for themselves for pretending to do their job and pretending to service my account. Write a Review for PennyMAC!